One of the most acknowledged problems in the Annapolis area is our congested “corridors” because they provide the only way in and out of various areas in the City and surrounding parts of the County. If there is a closure, mayhem ensues. In addition, these roads – really STROADS now – are terrible for everyone: drivers, pedestrians, cyclists and businesses because they do nothing well. If you are not familiar with this term, I highly recommend you watch this video to understand why they are so unproductive. They don’t move cars fast, they are dangerous for pedestrians and cyclists and are typically ugly, unloved places people do not want to spend any time other than driving in and out, which hurts businesses. Pretty much everyone accepts this status quo and does not fundamentally question why it is this way and what can be done differently to work better for everyone. All we hear is either “no more development” or “add more lanes”. Keeping things exactly as they are now with a development moratorium and/or adding capacity are just short term band aid solutions that are either unrealistic or too expensive; as unpopular as this opinion may be, development is going to happen, that is the way it works in the free market in this country. However, development is not the problem; the development pattern is the problem. Transportation and land use must be considered holistically to address the fundamental issue: how we design neighborhoods and neighborhood streets. We have gone away from a development pattern utilizing grids of neighborhood streets that has worked well for hundreds of years to one that emphasizes single point of failure roads that prioritize automobile traffic over all else. In the newer parts of Annapolis, we have allowed – and continue to allow – this auto-centric development pattern that has become de rigueur for developers since suburban boom of the 60s. I want to explore the development patterns in Annapolis’ context and illustrate how the conventional development wisdom of the last 50 years – the only thing many people know – keeps luring us in the wrong direction. Despite the forward-looking guidelines in our planning documents, there are many examples of developments in various stages along this corridor that are incongruous with the ideas put forth in those planning documents. At this point, there is no simple fix; that said, we have to work towards a different paradigm that I discuss below if we expect it to ever improve the situation. 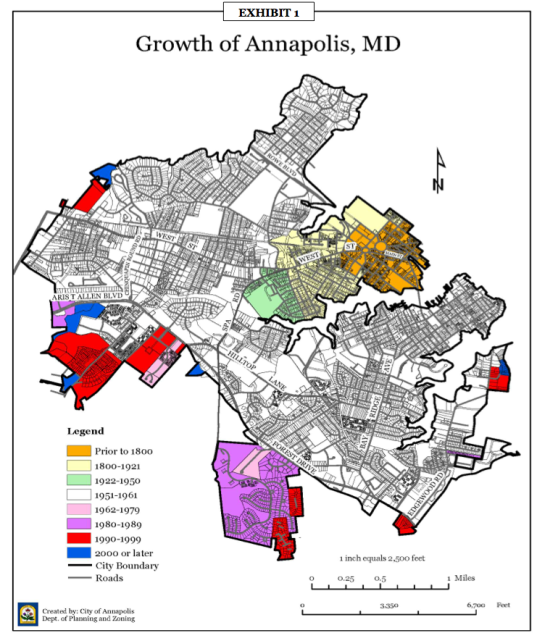 Annexation of land over the history of Annapolis. Note how the street layout changes with time. There are many motivations for annexation and they are often controversial but if it is done in a productive way, i.e. the land use pattern generates more in tax revenues than it costs the city in services over the full lifecycle, it’s not a bad thing. But I digress, that is a topic for another time. Evolution of street layouts over the 20th century. Through their research, Garrick and colleague Wesley Marshall are now making the argument that we got it all wrong: We’ve really been designing communities that make us drive more, make us less safe, keep us disconnected from one another, and that may even make us less healthy. Street grids provide intrinsic benefits. First, they allow the most direct access between two places. This efficiency is especially important when walking or riding a bike, but also for drivers. Second, a grid provides multiple paths to get from place to place which has the effect of distributing cars throughout the grid and minimizing congestion. And, if one route is blocked, there will be equal alternatives. As long as the street design is done correctly to maintain slower traffic appropriate for a residential street, there will not be issues with speeding. Third, with a grid of slow speed city streets, there is no need for additional infrastructure for other transportation modes such as bicycles because these streets are inherently “complete streets“. 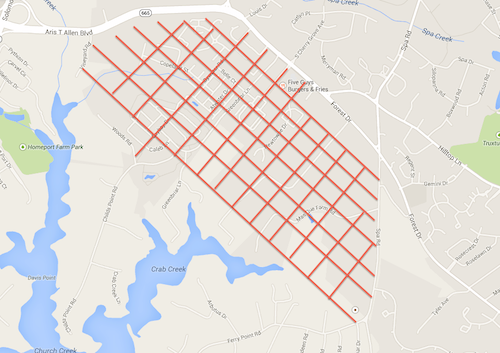 We certainly see the effects of the lack of a grid along Forest Drive. There are no through streets which funnels all cars, pedestrians and cyclists onto Forest Drive. That is the intention in this development pattern where it is assumed that all trips are by car. From a practical standpoint, it is unpleasant at best and unsafe at worst to make trips on foot or by bike so no one does, which promotes even more auto dependence. To make matters worse, the commercial development essentially makes Forest Drive into a local street with driveways/access to business while simultaneously trying to move high volumes of cars quickly. Frankly, it does neither well, the classic definition of a STROAD. Furthermore the 2009 Comprehensive Plan continues this thought in the Land Use and Transportation chapters for the Forest Drive Opportunity Area by indicating the need to have more intense, mixed use, urban center low development with an upgraded “transportation network”, but unfortunately does not explicitly state the form of the street network. There are several development projects proposed on annexed land that have preliminary site plans, The Reserve at Quiet Waters and Crystal Springs. These two are very controversial for many reasons, and I am not making a statement for or against here, but suffice it to say both follow the development patterns of the cul-de-sac generation, rather than knitting those developments into a traditional city street grid along the southwest side of Forest Drive. This is clear from their site plans here and here. For sure a different pattern would not solve the myriad of issues around those developments (schools, environment etc. ), but would go a long way to supporting the additional density if there were a traditional street grid. The City should insist street grids be incorporated into these developments so that eventually as subsequent development occurs, the entire area will all knit together as a comprehensive city, rather than let these projects exist as development islands requiring auto transport in and out as we typically see in subdivisions in rural/greenfield areas. Unfortunately, this “island mentality” seems to be winning out. This is what we have to change. Instead of thinking about how we can do things differently, the future looks like doubling down on the existing pattern as indicated by legislation recently introduced at the City Council (Resolution R-33-14) . 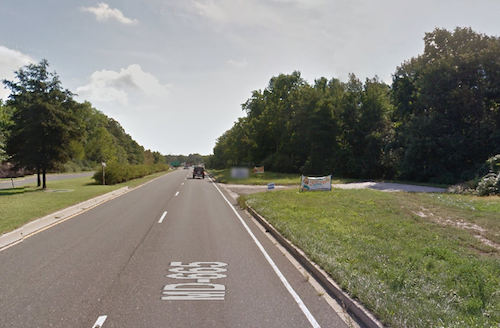 This legislation would allow vehicular access to a planned neighborhood off Aris T. Allen (MD 665) along the “highway” portion between the MD 2 interchange and the Aris T. Allen/Forest Drive/Chinquapin Round Road intersection. While this appears to be a “transportation” issue (disclosure, I sit on the City Transportation Board), it is a mistake to characterize this resolution this way; it is really a holistic land use and transportation issue. Satellite View of the proposed area. 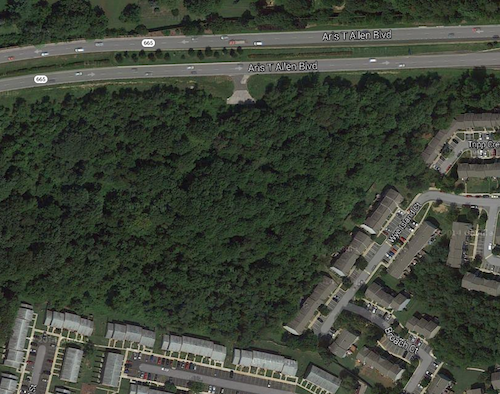 The proposed access to Aris T. Allen is a the top of the image. Street View south on Aris T. Allen. The proposed access has an existing curb cut on the right. Adding access to Aris T. Allen will be extremely dangerous. This is a limited access highway and people travel 50-60 even 70 mph down that section. If you add turning vehicles in and out at 10 mph there will be serious crashes and deaths because of high differential speeds. To add insult to injury it will be worse for drivers because it will interrupt the flow of traffic, the primary function of this road. Why take a road that is meant to move cars efficiently (and nothing else) by design and intentionally degrade its effectiveness? Furthermore, closing off access through the existing development and forcing all access via Aris T. Allen is even more egregious because it will be impossible to get in and out of that neighborhood unless you are in a car. What are pedestrians and cyclists supposed to do? Aris T. Allen is meant for cars and nothing else. 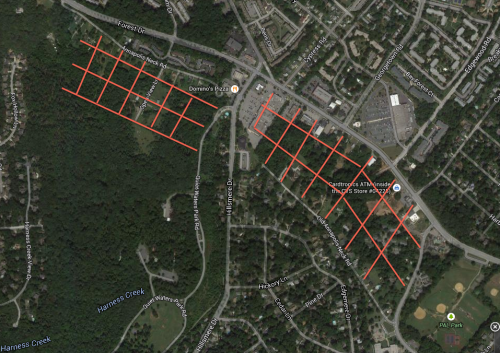 A traditional street grid imposed over the existing area including the Crystal Springs land. I show this not so much because I think it could practically be done at this point, but as an illustration of a pattern that has worked very well in the older sections of the city such as West Annapolis and Eastport. That said, any new development should be required to add additional streets that provide through access to create as much of a grid as possible. If this can not be accomplished, perhaps the development should not be allowed on the grounds that it does not conform is not consistent with the Comprehensive Plan. Finally, there is additional property along Forest Drive proper (the “Samaras property”) that is in early stages of annexation. This is part of the Forest Drive Opportunity Area as outlined in the Comprehensive Plan. This area represents the best opportunity to implement a traditional street grid because there is a significant amount of undeveloped or redevelopable land and it is expressly called out in the Comprehensive Plan for such development. Given there is already a mix of commercial and residential development, this could easily turn into the next neighborhood like West Annapolis, where people can, and do walk to near by services without needing to drive, as long as it is done with an appropriate pattern. Forest Drive Opportunity Area and Reserve at Quiet Waters with a traditional street grid. While there is some justification for a non-traditional pattern in low density rural areas where it is assumed you only travel by car and will remain that way, this is not what Annapolis is about. We are a city; we should act like a city. People who live in a city want, and in many cases need, to walk and bike places. Annapolis can support more density, will have more density in the future, and in fact needs more density if it is to have a workable transit system. However, the last thing we need in Annapolis is more auto dependent density. This means having neighborhoods with traditional street grids that provide efficient and pleasant access for people walking and riding bikes as well as driving cars. Eastport, West Annapolis and Homewood were all built this way and all transportation modes coexist more or less. This is what makes these areas so desirable. We did it this way for hundreds of years prior to the suburban building boom and there is a reason we did it this way: it works. The litmus test: can you take an easy, pleasant walk to the grocery store? I wrote about this recently. Implementation of street grids in new development and redevelopment should be a critical focus for the City planning organizations. Sure it may be more expensive, require compromise by residents and developers and may require more than a developer wants to do, but if development is done in a way that makes the City stronger, the return on investment will be there for the residents, the City and developers. We should not let bad development happen because we want to chase a tax base while it kicking a mess we see coming down the road, only to address it with no good choices at City/tax payer expense. I am not anti development, I am just anti bad development. We have an excellent Comprehensive Plan that outlines this, we just have to follow it, otherwise our choices just get worse as time goes on. 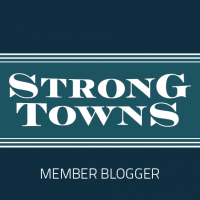 This entry was posted in Transportation, Urbanism and tagged Rocky Gorge, Strong Towns on November 4, 2014 by Alex Pline.